"The humans can look at the state of the world and tell themselves that the Earth is not dying. We cannot claim such ignorance as an excuse. The spirit realms are choking; the sun fades behind a blanket of unclean air. Our mother has fallen gravely ill, and her poisoner waits in the darkness and laughs. "Gaia! Our mother! We hear your cries of pain! Through we are few and out race is dying, we fight against your attackers! Let those who would torment you fear us - your avengers, your warriors, your will made flesh! Let them fear the Garou!" As the first fires of the Apocalypse begin to burn, the werewolves are in a desperate situation. The Garou need every trick, skill, ally and power they can muster in one last attempt to stave off the forces of corruption and decay. That's where the Werewolf Players Guide comes in. 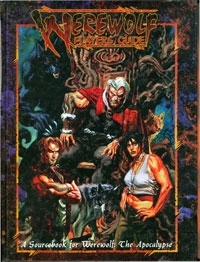 This book details the Garou's greatest strengths and weaknesses, and if offers you more options to flesh out your characters fully. Learn about the ways of the tribes, or walk the sacred ground of the septs. Listen to the whispers of the spirits, or learn the ways of Garou martial arts. Even track the footprints of the other elusive werecreatures - if you dare. The Werewolves Players Guide lets you do it all.